Smart Sport International - Is Running Becoming A Health Risk? First of all, I agree with the "leading a healthy lifestyle" mantra. Don't get me wrong - the more people that are running (or active), in theory, the better. This would help to foster an active lifestyle in an era in which 60% of children are obese and 34% of US adults age 20 and older are the same. We know that physical activity has a favorable effect on chronic medical conditions such as heart disease and diabetes. But I am not sure where "running a marathon" fits into a front-end goal to fostering an active lifestyle. The rationale behind running has changed a great deal over the past three decades. In the '80s, runners typically started with 5Ks and 10Ks, then decided that perhaps a half marathon (and then a marathon) might be a reasonable progression. Marathons were for the crazy runners. They had already developed an active lifestyle over time, and running a marathon was a natural goal progression and extension of that lifestyle. Somewhere in the past decade, running a marathon became a "bucket list" item. With the advent of training programs that "can get you to the finish line in 6 months", people started marathon training without necessarily having an active lifestyle for starters. But the more serious question is this: how does a marathon even get on the radar when you're sedentary? Secondly, there are some very disturbing statistics on running injuries. Prior to her running the 2009 Austin marathon, LeBlanc blogged about her experiences with multiple running injuries in training for her first marathon. In my humble opinion, it was sad and frustrating to see yet another runner injured, but in many ways, LeBlanc gave us a front row seat for the problem at hand. Prior to the 2009 NYC marathon, the NY Times posted this article, which reported that "injury rates have also climbed, with some studies reporting that 90 percent of those who train for the 26.2-mile race sustain injuries in the process". Generally speaking, the data would indicate that 60% of runners will sustain an injury in any given year that will alter their training - marathon training or otherwise. 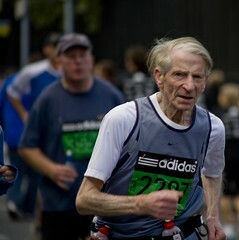 However, the more years you have been a runner, the lower your risk of injury. And just in case you might think that some people are more predisposed to injury than others, there is only one known cause of running injuries - training. 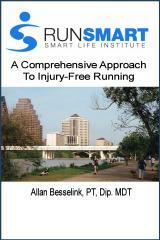 There is simply no evidence to relate any specific running injuries to any particular mal-alignment or such. The bottom line is this: there is a very high injury rate in runners, and there is a well-established relationship between running injuries and training. These statistics, combined with the massive increases in participation (especially for longer events like a marathon), are what are creating a health risk. Add to this the added aftershock - there are a lot of health care dollars being expended on treatments for these running injuries that have little to no basis in scientific evidence. Sadly, we are ignoring the solutions. Perhaps the debate isn't so much about "slow runners ruining marathons" as it is about "training programs injuring runners". Time is required by the human body to adapt to the demands of training. We should foster the development of runners over time, not just hammer them through six month marathon training programs and keeping our fingers crossed that a) they won't be so burnt-out afterwards that they hang up the running shoes (because they oftentimes do), or b) they won't sustain an injury in the midst of training and lose the desire to have that active lifestyle (again, something that they oftentimes do). Remember, the injury risk factor goes down with years of running experience. Does that mean that slower runners shouldn't be running marathons? No. But I would suggest that running a "slow" marathon (and slow is a relative term) is far more difficult than running a faster one. The irony in all of this is that the people that are out there for 5 or 6 hours or more are typically those that are least prepared to do exactly that, regardless of their training. Long-term health benefits are directly related to getting back to the roots of running - building active lifestyles first, then building better runners in the midst of this. The long term benefits of running for health are not so easily attained when the injury rate is so high. And for this issue, we need to look at the training programs - high on marketing and hype, and low on scientific premises. These same long-term benefits will not be accomplished with runners getting burnt-out or injured by their training. With science-based training plans, not only will people develop active lifestyles, they will become better, faster runners in the meantime - and then progress to that elusive marathon optimally and safely. And run faster in the process.